Bubble Guppies is a show shown on Nickelodeon that is aimed at young children, primarily preschoolers. The show features a group of small underwater children, similar to mermaids. The show teaches young children and preschoolers about everyday situations that might occur in their lives. Viewers learn something new in each episode of Bubble Guppies. This is a good show for busy parents who want their children to learn something beneficial from their TV shows, as opposed to other children's cartoons that are aimed only to entertain, not teach. The show was originally supposed to begin back in 2006, but production was stopped due to difficulties. After thinking that the show would never air, the first episode went live in early 2011. Presently, 26 episodes have been aired over the course of two series, and the show is popular with young children and their families. Each episode of Bubble Guppies follows a similar format. The show begins with the theme song being played. Following this the characters go to school, where some sort of event usually occurs. After this the cast of characters goes on with their school day, where they discuss with their teacher the events that happened prior to the school day. The Bubble Guppies than go on to do other things throughout their school day, such as have lunch and go on a field trip. Bubble Guppies is a great show for kids and families. The show encourages learning, play, and childhood growth. The show continues to air new episodes and seasons. Episode 1 - Guppy Style! Episode 13 - Trick-or-Treat, Mr. Grumpfish! Happy Halloween! Molly, Gil, and the rest of the Guppies are picking out costumes, trick-or-treating, and turning their classroom into a haunted house! It'll have to be really spooky if they want to scare Mr. Grumpfish! Summer is here! Molly, Gil, and the rest of the Guppies celebrate the season with lots of outdoor fun. Gil uses his summer camping skills to rescue Bubble Puppy during the Summer Camp Games! Episode 11 - Guppy Style! The Guppies hit the road to see a concert by Stylee, a singing sensation known for her fabulous styles! They'll travel by land, sea, and air€and encounter lots of new styles along the way€to get to the arena on time. Episode 10 - Bubble Baby! Molly's getting a new sibling, and the Guppies are thrilled! At the end of the day, the kids go to the hospital to meet the new baby! Episode 9 - Sheep Doggy! When Farmer Joe's cute baby lamb wanders off the farm during a popcorn storm, Bubble Puppy becomes a sheepdog to save the day! Episode 8 - The New Year's Dragon! The Guppies are excited for China's Lunar New Year Festival, where they will operate a giant festival dragon the the grand parade. Episode 7 - Space Guppies! When the evil robot Major Bummer tries to eliminate music from the galaxy, Princess Molly and the Guppies must restore peace, harmony and melody. Episode 6 - Temple of the Lost Puppy! When Bubble Puppy disappears after biting an ancient magic bone, the Guppies must embark on an adventure to find him. Molly and Gil see how delicious bubblecakes are made when they step into Chef Stef's kitchen.The Guppies get their turn when they take the field to play batterball! Episode 4 - Guppy Movers! When their friend Skip's moving day doesn't go as planned, Molly, Gil, and the rest of the Guppy Movers roll in to set things right in Skip's new home! Episode 3 - The New Doghouse! When an accident destroys Bubble Puppy's doghouse, the Guppies team up with the entire neighborhood to build Bubble Puppy's dream home - the most tricked out doghouse Bubbletucky has ever seen! Episode 2 - Costume Boxing! At the height of Fashion Week in Bubbletucky, Molly performs in the quick-change dress-up match. Her skills land her on the cover of Dress-Up!, the hottest fashion mag in town! Episode 1 - The Glitter Games! When Molly and Gil bring a comic book to school, all the Guppies want to be superheroes! In the comic book's pages, the smelly villain Sid Fishy aims to make the whole city stinky! Molly and Gil dive into the adventure as Guppy Girl and Bubble Boy, but can our heroes stop Sid? 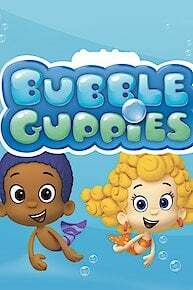 Bubble Guppies is currently available to watch free on Nick Jr., Noggin and stream on Nick Jr.. You can also stream, download, buy, rent Bubble Guppies on demand at Amazon Prime, Amazon, Vudu, Sling, FandangoNow, Google Play, DIRECTV NOW, iTunes online.